There’s one more type of web-based data sharing service that bears discussing. This type of service lets you share your notes and favorite websites with your friends and colleagues—or with yourself, if you’re on another computer. It works like this. You visit a website you like and decide you want to bookmark it or share it with others. Because bookmarks and favorites work only on a single computer, you instead save the site (and any notes you have about it) to an online bookmarking site. This saves your bookmark and notes to the cloud; you can then email the link to friends, or access it yourself at a later time. So-called notebook sites work in much the same fashion, but with random text notes you may take on any subject. Just upload your notes to the site, and then access them or share them via the web. To give you an idea of what’s available, let’s survey just a few of the more popular bookmarking and notebook sites. Figure 1. “Blinking” a favorite site with BlinkList. ClipClip (www.clipclip.org) does more than just bookmark favorite websites; it lets you clip and save text and images from websites and blogs to an online notebook. You can store and organize your clips for future use (great for research) or share them with others. Figure 2. Viewing web page clips with ClipClip. Clipmarks (www.clipmarks.com) functions much like ClipClip. You can clip any type of content from a web page and save it to the Clipmarks website. 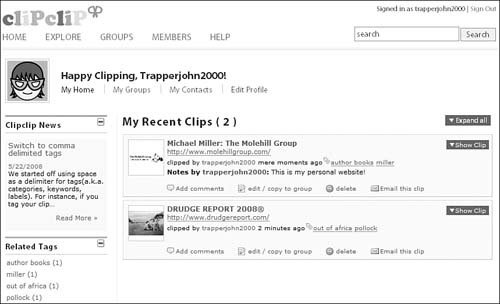 You can then access your clips at a later time from any Internet-connected computer, or share your clips with other users. The del.icio.us site is known by its unusual name, which is also its web address (del.icio.us). 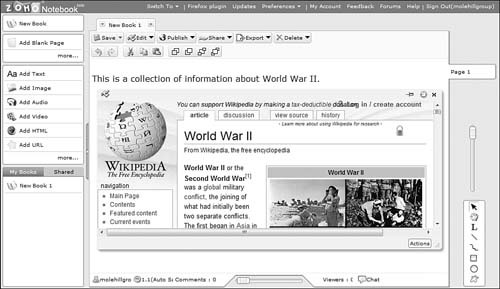 Shown in Figure 3, del.icio.us calls itself a social bookmarking site, in that it lets users store and share website bookmarks. In reality, del.icio.us is perhaps the most popular of these cloud bookmarking sites, with more than 3 million users and more than 100 million bookmarked URLs. The site is now owned by Yahoo! Figure 3. The most popular social bookmarking site, del.icio.us. 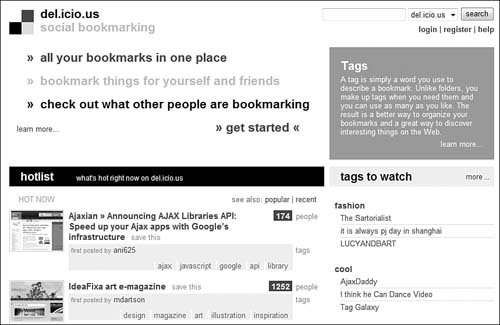 As with most of these sites, del.icio.us uses tags to help users find bookmarked sites. When you bookmark a site (often by clicking the del.icio.us button embedded on the site), you add a few keywords to describe the site. Other users can then search by keywords to find the most popular matching bookmarked sites. Feedmarker (www.feedmarker.com) is another bookmarking site. It’s unique in that it also functions as a newsreader for RSS and Atom feeds. You can also add newsfeeds as bookmarks. SharedCopy (www.sharedcopy.com) is billed as a “collaborative annotation service.” What that means is that you can save a copy of any web page to the SharedCopy site, while making all sorts of notes and highlights to that page. You can then share the annotated page with others of your choosing. Tagseasy (www.tagseasy.com) is an unusual combination of bookmarking, notebook, and cloud storage service. You can bookmark individual websites and share them with friends and colleagues, as well as upload and share individual documents (up to 1GB total storage). It’s a free service, so you might want to check it out. Yahoo! MyWeb (myweb.yahoo.com) is a simple online bookmarking service. 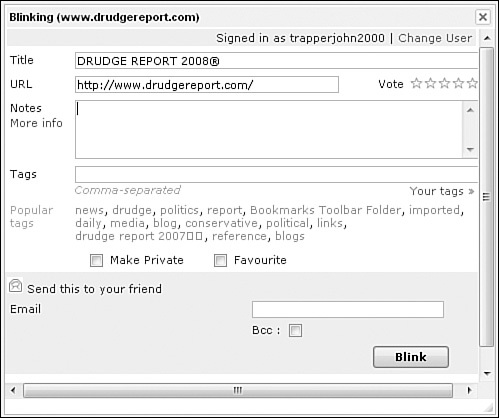 You can easily save any bookmark to the MyWeb site, and then access it from any computer or share it with friends and colleagues. Saving website URLs or clips of web page content is one way to save and organize your research. But what if you collect more than web clips—what if you also want to organize your notes, or content created in other applications? The solution may be a cloud-based notebook, such as the one offered by Zoho Notebook (notebook.zoho.com). Zoho Notebook enables you to aggregate all types of content—text, images, audio, video, web URLs—in a single place. Your aggregated content creates a notebook, like the one in Figure 4. Figure 4. Aggregating different types of content with Zoho Notebook. You can share all or part of your notebook with other users. Sharing can be as granular as an individual page or object on a page. You can also publish all or part of your notebook to a public web page. I like Zoho Notebook as a more holistic approach to organizing notes and information from disparate sources. It’s ideal for students collecting data for reports, as well as anyone doing research of any type. 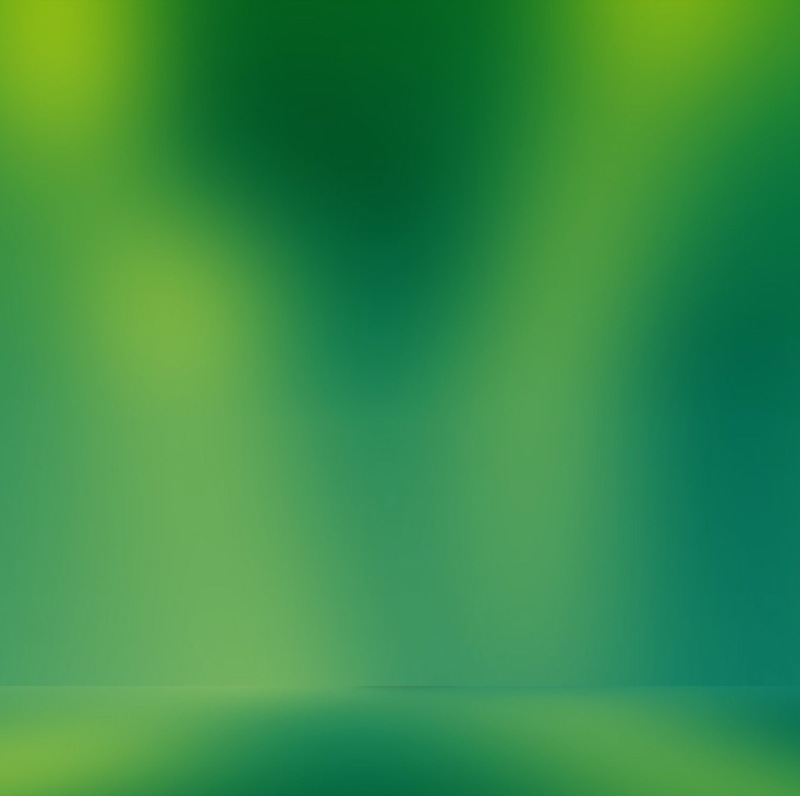 The best thing is, Zoho Notebook is a web-based application, which means you can access your research from any computer, or share it with others who may be collaborating with you.